The Mermaid's Tale: What do we know about Gregor Mendel and his work? Ken and I were asked to compile an annotated bibliography on Gregor Mendel for Oxford University Press's new bibliography initiative, Oxford Bibliographies Online (OBO). Our contribution will be in their new and growing Anthropology section. The Press is investing a lot in this, and they hope it will be widely used. Access is subscription-based, however, so presumably it's intended to be primarily for students and academics, whose university libraries subscribe. Anyway, we agreed to do it, thinking it would be a good reason to explore more about Mendel. And it was. We thought we knew pretty much enough about him to do this, since we knew what everyone knows about Mendel -- he was the Father of Modern Genetics, he was a Moravian monk who experimented on peas, which led him to propose his Laws of Inheritance. But, as it turns out only some of the things that "everyone knows" about Mendel are unassailable, while the rest of his legacy continues to be debated. Why did he do his experiments? Was he interested in understanding hybridization or heredity? What did he think he discovered? Did he actually propose his laws? Did he fudge his results? Was he brilliant and innovative, or did he do ordinary science, producing results that everyone already knew? And, why was his work ignored for 34 years after it was published? Mendel was born in 1822, into a farming family in Austrian Silesia, a province of the Austrian Empire, now the Czech Republic. His parents sent him to school, but hoped, as their only son, that he would one day take over the farm. He studied with a teacher interested in horticulture, who recognized him as a student with promise, and encouraged him to go to university. Mendel was determined to further his education, but due to difficulties at home, including that his father had a serious accident which meant he couldn't farm, at least for some time, Mendel was unable to finance his way. He seems to have been a sensitive soul, and describes this difficult time in a short autobiography he wrote when he was 28 as a part of his application for a teacher's examination. Four years later, due to several successive disasters, his parents were completely unable to meet the expenses necessary to continue his studies, and it therefore happened that the respectfully undersigned, then only sixteen years old, was in the sad position of having to provide for himself entirely. For this reason, he attended the course for "School Candidates [applicants] and Private Teachers" at the district Teacher's Seminary in Troppau. Since, following his examination, he was highly recommended in the qualification report (enclosure B), he succeeded by private tutoring during the time of his humanities studies in earning a scanty livelihood. When he graduated from the Gymnasium in the year 1840, his first care was to secure for himself the necessary means for the continuation of his studies. Because of this, he made repeated attempts in Olmiitz, to offer his services as a private teacher, but all his efforts remained unsuccessful because of lack of friends and recommendations. The sorrow over these disappointed hopes and the anxious, sad outlook which the future offered him, affected him so powerfully at that time, that he fell sick and was compelled to spend a year with his parents to recover. The entire autobiography, only two pages long, is well worth reading, even if somewhat melodramatic. Because his parents could not afford to send him to university, his best remaining option was to enter a monastery, which he did at age 21, joining the Augustinian Abbey in Brno. Because he was so sensitive, he was unable to perform priestly duties such as visiting the ill, so the abbot, a scholarly man himself, with interest in horticulture, sent him to the University of Vienna instead, where he studied physics, meteorology, botany, and mathematics. He left after three years and returned to the abbey where he resumed teaching. And, he began his experiments with peas. 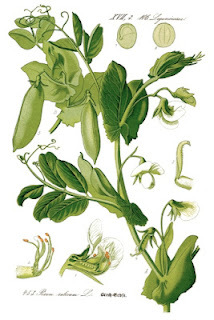 In 1854 he acquired 34 varieties of pea seed, Pisum sativum, from local nurseries and spent the next 2 years growing them to determine which characters bred true. Of these he chose 7 traits to follow through multiple generations--plant height, blossom color, pea characteristics, and so on. He produced 7 crosses, each repeated twice, from a seed plant with a particular trait and the second time with that same trait from the pollen plant, thus demonstrating that the male and female contribute equally to the offspring. He carried on his experiments for 8 years, counting the occurrence of these traits in nearly 30,000 peas. Because he chose his traits well, intentionally avoiding traits that did not breed true, he was able to document what became known as recessive and dominant inheritance, as well as the random segregation of alleles in offspring, and the independent inheritance of genes for traits using a sample size large enough to produce robust results. 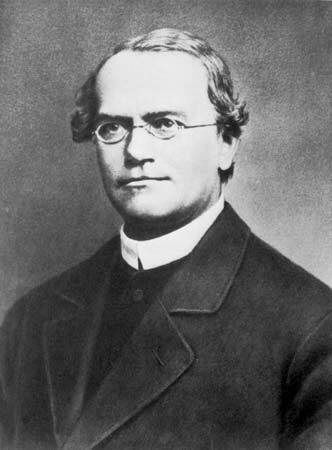 Mendel described his findings in two lectures, which he gave to the Brünn Society for Natural Science in 1865. It is said that no one in the audience understood the importance of what they heard that night. The lectures were subsequently published as Versuche über Pflanzenhybriden, or, in English, Experiments on Plant Hybridization in the Proceedings of the Natural History Society of Brünn, but his work met a muted reception and was long ignored. Among others, Mendel sent his paper to renowned Swiss botanist, Karl Wilhelm von Nägeli, for review but even Nägeli seems not to have understood its importance, and recommended that Mendel verify his findings with further experiments, this time on Hieracium, or hawkweed. Unfortunately, these are plants with unusual modes of inheritance, and the experiments did not give Mendel the results he would have expected, given what he knew about peas. Mendel died in 1884, either believing his work would be recognized one day, or discouraged, and believing he really hadn't found anything of importance, depending on who you read. Because he was not a person of note when he died, all of his personal papers, letters, notes from his experiments, were burned not long after his death. For this reason, it's difficult to reconstruct his experiments, his thoughts about his motivation and what he believed he found -- the aspects of his life and work that are still debated. Among the few documents written by Mendel that survived his death were the letters he wrote to Nägeli. He also wrote a paper describing his work on hawkweed, which was published, after which he did no further work with plants. Whether this was because he was discouraged or because he was distracted by work, as he had become abbot by then, is not known. He had a lifelong interest in meteorology, as well as horticulture, and published a paper in 1871 suggesting the cause of tornadoes. His reasoning was largely correct, but this paper, too, was long ignored. These are the bare bones of Mendel's life and work. A handful of excellent biographies have been written, as well of hundreds of papers asking and addressing the questions of the legitimacy and motivation of his work. The most measured of these (a 1992 paper by Orel and Hartl is among the best) suggest that if people would simply read his paper, they'd see that he explained what he did and why, and what he thought he had discovered. Indeed, he wrote to Nägeli that he was sure his work would be understood in the fullness of time. Mendel did not formulate what have come to be known as his Laws, although he did understand about independent assortment and segregation of whatever it was that caused his traits, he didn't discover genes, although he understood there were Anlage, or 'elements' that were inherited and caused his traits, he didn't discover dominant and recessive alleles, although he understood that pairs of elements were inherited, but only one trait was seen in the first generation, while two were seen in subsequent generations, nor were his experiments muddied by genetic linkage, two genes close together on a chromosome that were inherited together rather than independently. Mendel did many things for science, regardless of how he felt about his work. He laid out the foundations for the understanding of genetics. But that was because of the methodological path his work opened. Genes became real, discoverable causal entities fundamental to life. His 'cheating' was totally minor as far as this goes. But Mendel misled us in important ways, as well. By making his points with highly selected, simple traits, he provided an expectation of strong single-element causation as the basis of biology. That helped find genes when they were closely connected to traits, as in his peas. But most biological causation--relationship between genes and traits, is far from simple in that way. So he also misled us, in ways Ken tried to outline a few years ago. We'll note some of the implications of his work in a forthcoming post. Meanwhile, Mendel is properly honored for laying the groundwork for the time when enough was known about genes and heredity that his results could be understood in context, and built upon. As such, he was indeed the Father of Modern Genetics. He was a middle child. Not a middle child. He was the youngest of 3; two older sisters. The oldest sister's husband bought the family farm and gave him a part of the proceeds to help him continue his studies. The younger sister (middle child) gave up part of her dowry to help him continue his studies.